I have only white and blue/purple in my garden and of course green.Then I have one stubborn red tulip. For three years I’ve had that tulip showing up every April. For three years I’ve cut it off as soon as it flowered, put the flower in a vase, dug up the bulb and gave it to a friend. Just to repeat the process the following year. I’ve accepted the red tulip in my garden now. It is in a vase in my bedroom, I’ve dug up the bulb to give to a friend and I’ll wait for it next year. I struggled with these sketches. I can’t get all these nuances of green down in a flattering manner. It all looks messy. Maybe it is too much green on one go…I do actually feel a little sick. SoI’ll take my leave now. Well, I realy like those drawings. You must have a wonderful garden…and to me it isn’t messy at all! These are really wonderful. I love the various items you have in your garden and the meticulous depiction of chicken wire! Oh My Lord you made me laugh!!! I am right there with you girl. 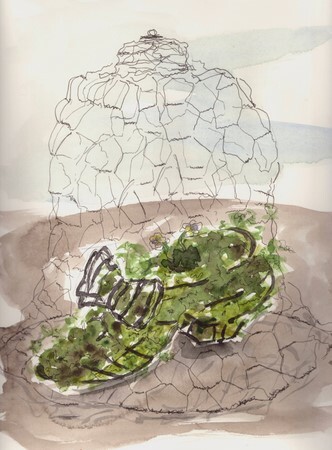 The sketches are lovely, light and luscious. Would love to see that rouge tulip too. Perhaps a progression of sketches in the garden will follow?! These are beautiful sketches Ronell. And Sandy, I have to tell you, she does have a very beautiful garden! I see you have a beautiful and interesting garden and a great blog. Thanks for visiting mine. What an interesting garden! WHAT UNUSUAL GARDEN PIECES!! BEAUTIFUL!!!! And that red tulip — what a hilarious story! Yep, we’d be in trouble together! Gardening and sketching!! GREAT JOB! There are so many wonderful watercolour effects here – I have no idea how you’ve done them, but I really like them. I also like the various little faces peeping out of these sketches. I know how you feel – I was pulling out old vines in my backyard today – oh my back!Very nice sketches, I’m sure they help bring some comfort! Thank you everybody, I appreciate the time and effort put into leaving a comment..Sandy, I’ll probably do more sketches as the garden grows month by month…the summers provide so much fun subjects in and around our gardens! I am already impressed by your artistic ability. And now, you further impressed me with your green thumb. 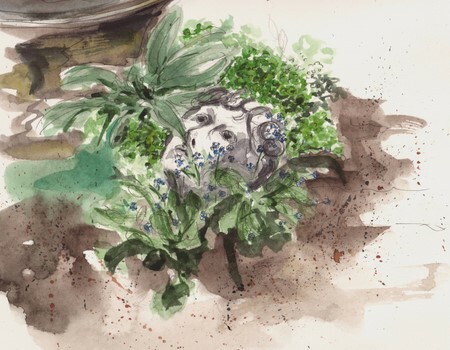 Are these sketches from your garden? Oooohhh-aaaahhhh, so many lovelies to be found in your garden! I shouldn’t be surprised … you seem to exude beauty all around you. *Send that tulip my way, Ronell, I’m sure I can kill it in a second. My mom said that I’m the only person she knows who can kill a cactus! They say every room should have a touch of red, so maybe the same thing holds true for gardens! (Though I don’t remember seeing anything red in the white garden at Sissinghurst ;D.) Your cool and subtle palette works very well indoors and out! WOW! 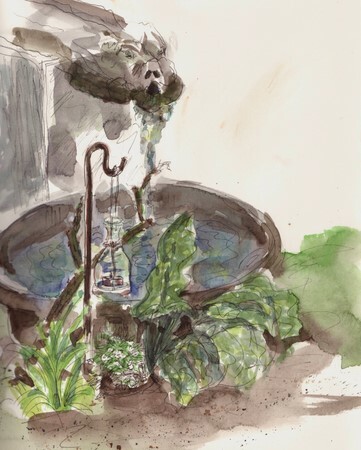 I love your sketches – I do hope you do more of your garden!! I especially like the water feature, I can almost hear the tinkling of the water. How hilarious about the tulip! After you dig up the bulb, someone must be sneaking a new bulb in the ground while you sleep – ha. These are beautiful! I don’t think they are messy at all. What a lovely place to practice something that is enjoyable. There is nothing as special as honoring your riches. I love how you captured the water in your last painting, and the effect that you created on the front leaves. Continue doing what works and explore with what you want to improve. Seems like you are on the right path. Thanks Robin….and ks klein, no I’m not in the least offended and yes, I can now also see how it might come from Hulk. To tell the truth, I felt a bit like the hulk after I’ve done all this green! Thanks for the comment.